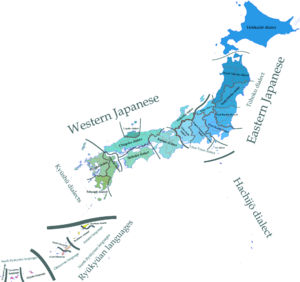 The dialects of the Japanese language fall into two primary clades, Eastern (including Tokyo) and Western (including Kyoto), with the dialects of Kyushu and Hachijō Island often distinguished as additional branches, the latter perhaps the most divergent of all. The Ryukyuan languages of Okinawa Prefecture and the southern islands of Kagoshima Prefecture form a separate branch of the Japonic family, and are not Japanese dialects, although they are sometimes referred to as such. Regional variants of Japanese have been confirmed since the Old Japanese era. Man'yōshū, the oldest existing collection of Japanese poetry, includes poems written in dialects of the capital (Nara) and eastern Japan, but other dialects were not recorded. The recorded features of eastern dialects were rarely inherited by modern dialects, except for a few language islands such as Hachijo Island. In the Early Middle Japanese era, there were only vague records such as "rural dialects are crude". However, since the Late Middle Japanese era, features of regional dialects had been recorded in some books, for example Arte da Lingoa de Iapam, and the recorded features were fairly similar to modern dialects. The variety of Japanese dialects developed markedly during the Early Modern Japanese era (Edo period) because many feudal lords restricted the movement of people to and from other fiefs. Some isoglosses agree with old borders of han, especially in Tohoku and Kyushu. From the Nara period to the Edo period, the dialect of Kinai (now central Kansai) had been the de facto standard form of Japanese, and the dialect of Edo (now Tokyo) took over in the late Edo period. With modernization in the late 19th century, the government and the intellectuals promoted establishment and spread of the standard language. The regional languages and dialects were slighted and suppressed, and so, locals had a sense of inferiority about their "bad" and "shameful" languages. The language of instruction was Standard Japanese, and some teachers administered punishments for using non-standard languages, particularly in the Okinawa and Tohoku regions (see also Ryukyuan languages#Modern history) like as vergonha in France or welsh not in the UK. From the 1940s to the 1960s, the period of Shōwa nationalism and the post-war economic miracle, the push for the replacement of regional varieties with Standard Japanese reached its peak. Now Standard Japanese has spread throughout the nation, and traditional regional varieties are declining because of education, television, expansion of traffic, urban concentration etc. However, regional varieties have not been completely replaced with Standard Japanese. The spread of Standard Japanese means the regional varieties are now valued as "nostalgic", "heart-warming" and markers of "precious local identity", and many speakers of regional dialects have gradually overcome their sense of inferiority regarding their natural way of speaking. The contact between regional varieties and Standard Japanese creates new regional speech forms among young people, such as Okinawan Japanese. Eastern Japanese dialects are blue, Western Japanese tan. Green dialects have both Eastern and Western features. 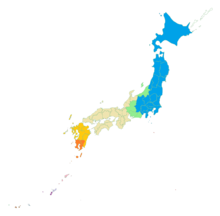 Kyushu dialects are orange; southern Kyushu is quite distinctive. Map of Japanese pitch-accent types. The divide between Kyoto and Tokyo types is used as the Eastern–Western Japanese boundary in the main map. There are several generally similar approaches to classifying Japanese dialects. Misao Tōjō classified mainland Japanese dialects into three groups: Eastern, Western and Kyūshū dialects. Mitsuo Okumura classified Kyushu dialects as a subclass of Western Japanese. These theories are mainly based on grammatical differences between east and west, but Haruhiko Kindaichi classified mainland Japanese into concentric circular three groups: inside (Kansai, Shikoku, etc. ), middle (Western Kantō, Chūbu, Chūgoku, etc.) and outside (Eastern Kantō, Tōhoku, Izumo, Kyushu, Hachijō, etc.) based on systems of accent, phoneme and conjugation. Copula isoglosses. The blue–orange da/ja divide corresponds to the pitch-accent divide apart from Gifu and Sado. While these grammatical isoglosses are close to the pitch-accent line given in the map, they do not follow it exactly. Apart from Sado Island, which has Eastern shinai and da, all of the Western features are found west of the pitch-accent line, though a few Eastern features may crop up again further west (da in San'in, miro in Kyushu). East of the line, however, there is a zone of intermediate dialects which have a mixture of Eastern and Western features. Echigo dialect has harōta, though not miyo, and about half of it has hirōnaru as well. In Gifu, all Western features are found apart from pitch accent and harōta; Aichi has miyo and sen, and in the west (Nagoya dialect) hirōnaru as well: These features are substantial enough that Toshio Tsuzuku classifies Gifu–Aichi dialect as Western Japanese. Western Shizuoka (Enshū dialect) has miyo as its single Western Japanese feature. The Western Japanese Kansai dialect was the prestige dialect when Kyoto was the capital, and Western forms are found in literary language as well as in honorific expressions of modern Tokyo dialect (and therefore Standard Japanese), such as adverbial ohayō gozaimasu (not *ohayaku), the humble existential verb oru, and the polite negative -masen (not *-mashinai). /e/ is pronounced [je] and palatalizes s, z, t, d, as in mite [mitʃe] and sode [sodʒe], though this is a conservative (Late Middle Japanese) pronunciation found with s, z (sensei [ʃenʃei]) in scattered areas throughout Japan. as some subdialects in Shikoku and Chugoku, but generally not elsewhere, the accusative particle o resyllabifies a noun: honno or honnu for hon-o 'book', kakyū for kaki-o 'persimmon'. Much of Kyushu either lacks pitch accent or has its own, distinctive accent. Kagoshima dialect is so distinctive that some have classified it as a fourth branch of Japanese, alongside Eastern, Western, and the rest of Kyushu. A small group of dialects spoken in Hachijō-jima and Aogashima, islands south of Tokyo, as well as the Daitō Islands east of Okinawa. Hachijō dialect is quite divergent and sometimes thought to be a primary branch of Japanese. It retains an abundance of inherited ancient Eastern Japanese features. ^ Satoh Kazuyuki (佐藤和之); Yoneda Masato (米田正人) (1999). Dōnaru Nihon no Kotoba, Hōgen to Kyōtsūgo no Yukue (in Japanese). Tōkyō: The Taishūkan Shoten (大修館書店). ISBN 978-4-469-21244-0. ^ See also Ainu language; the extent of Ainu placenames approaches the isogloss. ^ a b c Masayoshi Shibatani, 1990. The languages of Japan, p. 197. Look up Category:Regional Japanese in Wiktionary, the free dictionary. Wikimedia Commons has media related to Japanese dialects.